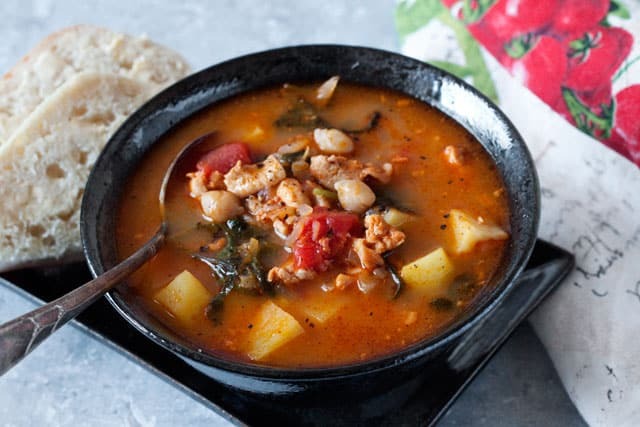 This Pressure Cooker Chorizo, Chicken and Kale Soup is a spicy soup loaded with good for you ingredients, garbanzo beans, tomatoes, and kale. She also shared a wonderful soup recipe, Rachel Ray’s Portuguese Chourico and Kale Soup recipe that she converted to a pressure cooker recipe. She also added chicken thighs to bulk up the soup with more protein. An Instant Pot is one of the most popular brands of electric pressure cookers. 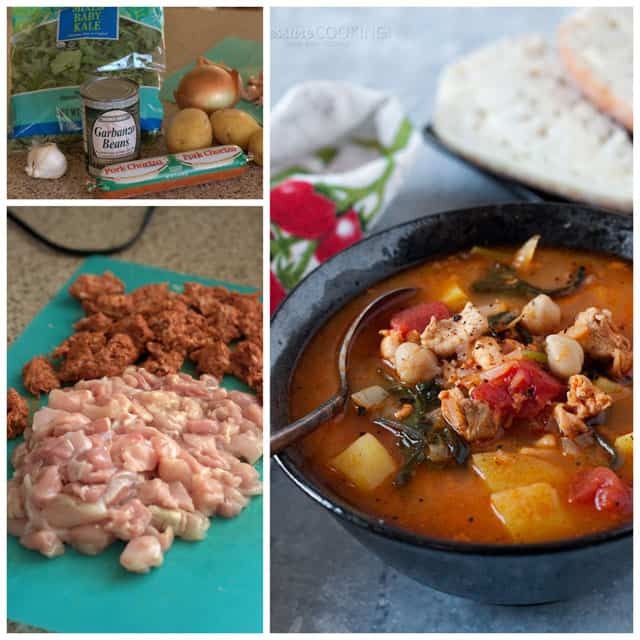 They are easy to use and your Instant Pot can help you create this delicious Chorizo, Chicken and Kale Soup! Rachel used a Portuguese chourico in her recipe, but I picked up a Mexican chorizo to use in mine. It wasn’t a firm pepperoni-style sausage. It doesn’t stay chunky, but it added a wonderful flavor to the soup. It was pretty spicy though, so if you don’t like your soups spicy, you may want to use less chorizo. My family really enjoyed this soup, and I can see why Mary Beth was excited to share it with me. It’s easy to make and tastes like it’s been simmering for hours. 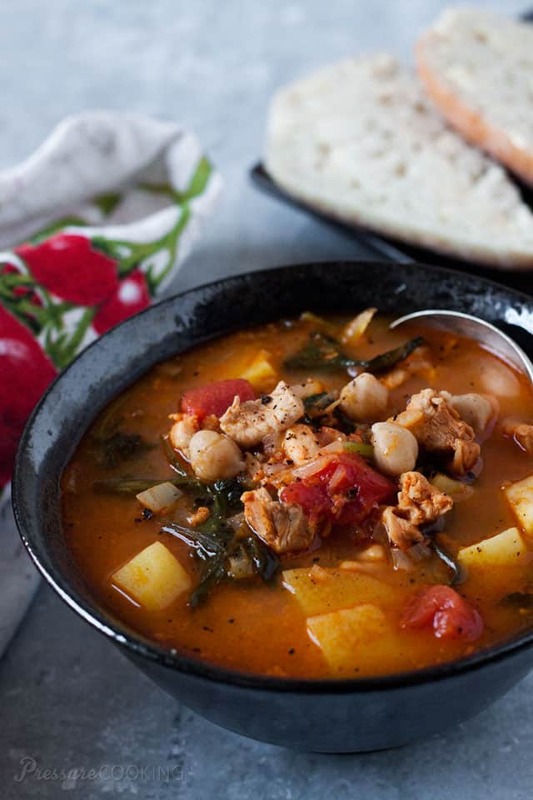 I’m also sharing this soup as part of this month’s virtual progressive dinner, Progressive Eats. I usually share my Progressive Eats recipes on Barbara Bakes, but since this month’s theme was Soups On!, it was the perfect time to finally share one on Pressure Cooking Today. I hope you’ll give this soup a try, and also check out all the soup, salads and dessert the talented Progressive Eats bloggers shared this month. Preheat pressure cooking pot on the browning setting. Add 1 tablespoon oil to the pressure cooking pot. Add chorizo, chicken and onion and cook, stirring occasionally until the onion is tender, about 5 minutes. Add garlic and cook 1 minute more. Add chicken broth, tomatoes, and bay leaves to the pressure cooking pot. Stir to combine. Stir in potatoes and kale. Lock lid in place, select High Pressure and 4 minutes cook time and start. When timer beeps, turn off pressure cooker and do a quick pressure release. Carefully remove the lid and remove the bay leaves from the soup. Stir in garbanzo beans. Add salt and pepper to taste. If necessary, select sauté and cook until potatoes are tender. My family not kale lovers but do love spicy so can I substitute spinach as I usually do for recipes calling for kale. Wondering if spinach will turn out too mushy under pressure thus should I add at end of cooking with the garbanzo beans? Thank you. Hi Sandra – I like the idea of stirring spinach in at the end with the garbanzo beans. Enjoy!